The Axios Delta Management Authority organizes every year a number of actions and events aiming to raise public awareness on the importance of the Axios Delta protected area and its benefits to the people. It is a common perception nowadays that the involvement of the people and –most importantly- of the users of the protected areas is essential for their effective management and protection. In order to serve these aims the Management Authority operates information structures for visitors, such as the Axios Delta Information Centre and the Nea Agathoupoli Birdwatching Tower. It caters for the creation of print, digital or audiovisual information material, the signage of the area, takes part in events giving talks or presentations and also organizes its own events, approximately 12 events yearly. One or our most important actions is the Clean up Campaign, taking place each spring, engaging some hundreds of volunteers every year. Meetings with the local are also an important part of our communication efforts. 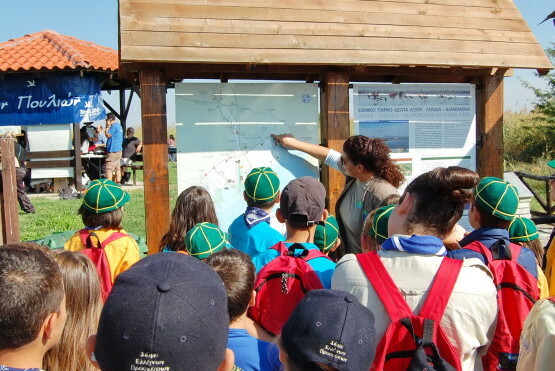 As far as environmental education is concerned, the Management Authority receives each year around 2.500 pupils or students, as well as groups, associations or environmental organization who wish to get to know the area. Every year the Management Authority takes part in promotion fair, and most specifically the Thessaloniki Tourism Exhibition Philoxenia and the British birdwatching exhibition Birdfair.